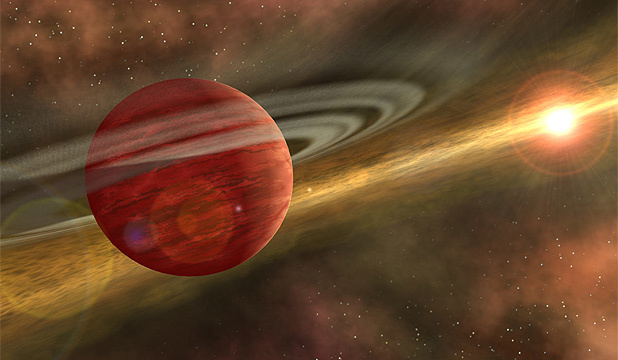 A 16-year-old Australian fan of Doctor Who has launched a petition to name a planet Gallifrey. He’s picked a big orange planet that fits what little is known about the Doctor’s homeworld. Please rename the newly discovered planet “HD 106906 b” to Gallifrey! In honour of Doctor Who and its 50 years! even if it’s just a second name or officially recognised as “also known as Gallifrey”. Doctor Who is legendary, award winning, record breaking, and global and this planet deserves something special and supernatural as its name, How better to honor its existence than by dubbing it the home planet of our beloved time travelling alien, The Doctor? The petition at Change.org has 134,389 signatures at this writing. Menhennet may have been inspired by the revelation in Day of the Doctor, released in theaters for a single day to celebrate the 50th anniversary of the series, that Gallifrey still exists, and was not destroyed in a battle between the Time Lords and the Daleks as believed. “It’s locked in a single moment of time, in a pocket universe,” Sam explains helpfully.